The first debate in a Senate race that could shape up to be one of the most critical in the country was largely an argument over which candidate would be less beholden to politics and stand up more for the people of North Dakota. “I ran six years ago and I said, ‘I’m not joining any team.’ I’m not 100 percent with anyone other than North Dakota,” said Democratic Sen. Heidi Heitkamp in the debate against her Republican challenger Rep. Kevin Cramer. Republican U.S. Rep. Kevin Cramer, front, makes a point as North Dakota Democratic U.S. Sen. Heidi Heitkamp listens during the U.S. Senate Candidate Debate on Thursday night, Oct. 18, 2018, in Bismarck, N.D.
“Donald Trump stands with North Dakota more often than Heidi Keitkamp stands with North Dakota,” he said during the debate, which aired across the state Thursday night. Heitkamp is a Democrat running for re-election in a state President Donald Trump won handily in 2016. 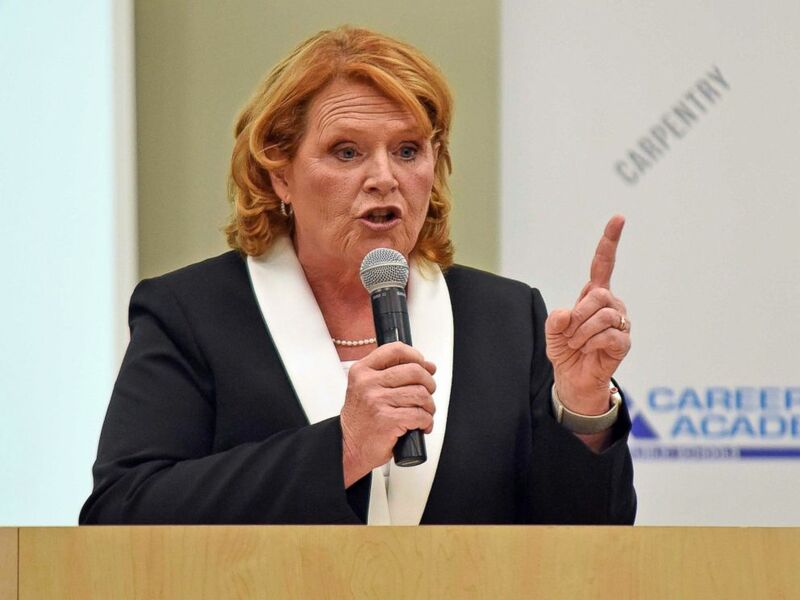 It is forcing the senator to maintain a tough balance, and recent public polling shows Heitkamp behind Cramer by double digits -- a fact she likes to say was also reported when she won in 2012 by only about 3,000 votes. Because Democrats need to not only defend 10 seats in states Trump won in 2016, but also pick up two seats in reliably Republican states in order to take control of the chamber, Heitkamp’s seat is key. According to FiveThirtyEight’s voter power index, North Dakota’s voters are the most powerful in the country. And in order to come out victorious, Heitkamp will have to win over voters on both sides of the aisle and go up against the Trump-endorsed Cramer, who benefits from the president’s popularity in the state. 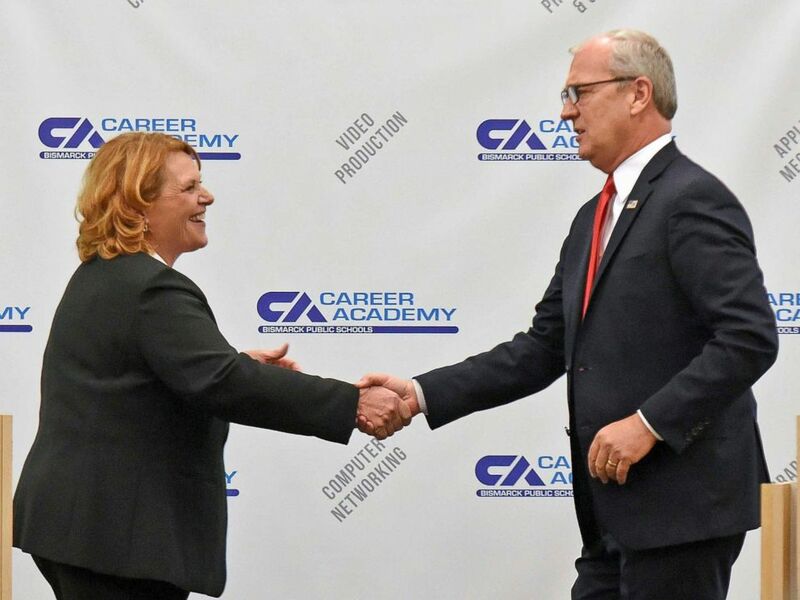 North Dakota Democratic U.S. Sen. Heidi Heitkamp, left, and Rep. Kevin Cramer shake hands at the conclusion of the U.S. Senate Candidate Debate sponsored by the North Dakota Newspaper Association on Thursday, Oct. 18, 2018, in Bismarck, N.D.
“When one team is so much better for North Dakota than the other team, you don’t abandon the good team half the time just to say you’re only with ‘em half the time,” Cramer said, knocking Heitkamp’s work across the aisle. “[Trump’s] on the right side of North Dakota, that’s what matters,” he said. “When you look at my history and my record with the president, I’ve attended many signing ceremonies, worked with the administration. He knows that,” said Heitkamp, who votes in line with Trump around 54 percent of the time, according to FiveThirtyEight’s tracker. “And so, you know, I think people see through that,” she added. Heitkamp hammered her moderate voting record in the debate, shedding light on her bipartisan accomplishments and diverting Cramer’s attempts to pair a vote for him with support for the president. “I think it’s interesting that Congressman Cramer talks about President Trump. Why not talk about what you’ve done, why not talk about your accomplishments, why not about your bipartisan credibility?” asked Heitkamp. 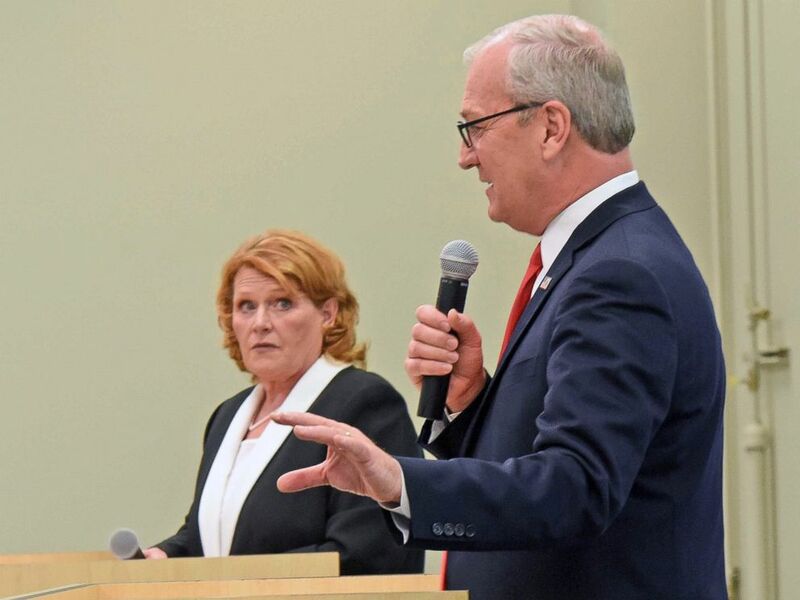 North Dakota Democratic U.S. Sen. Heidi Heitkamp makes a point in the U.S. Senate Candidate Debate with Republican U.S. Rep. Kevin Cramer on Thursday, Oct. 18, 2018, in Bismarck, N.D.
“Because when you look at rankings, no matter what he says, I’m 50th-most conservative and 49th-most liberal,” Heitkamp said. “This is the thing, she's with them when we don't need her. She's never been with them when we needed the vote. And that's the problem,” he said in an interview after the debate. The #MeToo movement has also played a role in each of the two candidates’ campaigns, and Cramer was quick to hit Heitkamp for voting "no" on Trump’s pick for the Supreme Court, Justice Brett Kavanaugh. “You vote against Brett Kavanaugh when 64 percent of your constituents want you to vote for Brett Kavanaugh?” he asked rhetorically in an interview after the debate. He also called out Heitkamp for running an advertisement that inadvertently outed women who were victims of sexual assault, which she opened the debate by apologizing for. “I just thought it was really important to begin, to just say, ‘I'm sorry,’” Heitkamp said of the decision to use her opening statement to apologize. Asked if the mistake might lose her votes with Independent women, a key bloc of support in the state, Heitkamp said it wasn’t about votes. “This really for me isn't about the election. This is about, ‘I made a bad mistake, my campaign made a bad mistake, and I need to own it, and I need to do everything possible to fix it,” she said. “So that's not about getting votes or losing votes. That's about making amends,” she added. Heitkamp responded tearfully, when first asked about Cramer’s comments in early October, and said her own mother, a victim of sexual assault, was no less tough because of it. Cramer, speaking separately, pointed to a different quality he thinks voters appreciate -- and defended his comments to The New York Times. “What I think North Dakotans like is they like common sense,” he said. “And when a movement becomes so extreme that it's now hurting the very cause and the people that it states that it's helping, North Dakotans see through that quickly. And when you call it out, in Washington they think it's a gaffe. Here they think it's somebody talking to them,” Cramer said. Both Heitkamp and Cramer also described health care and tariffs as key issues for voters in the state. 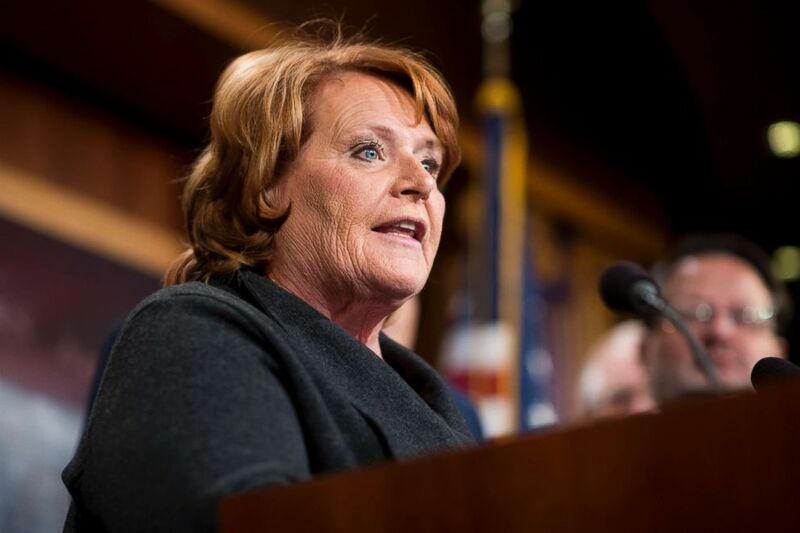 Heitkamp is aiming to preserve the Affordable Care Act while Cramer wants to replace it, and Heitkamp is against Trump’s tariffs while Cramer supports the president’s efforts. Sen. Heidi Heitkamp speaks during the Senate Democrats news conference on tax reform in the Capitol, Nov. 28, 2017. “Tariffs are a key issue in the media, and they are a key issue certainly to the people directly affected, but even most of them, soybean farmers, as an example, strongly support Donald Trump,” Cramer said. Over the summer, the Trump administration announced tariffs of 10 percent on more than $200 billion of imported Chinese goods. The response from China hit Trump country specifically, with tariffs on billions of dollars of American products, including soybeans.